This past Sunday I attended a lovely workshop in the city, but before I share more about that I want to share with you my outfit for that day. I felt like the lady in green (pun on Lady in Red) and I loved it because green is easily becoming one of my favorite colors. 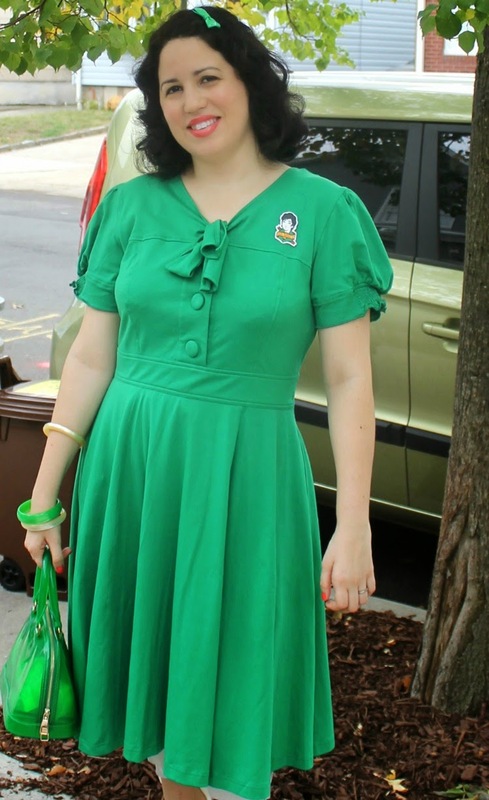 When I saw this shade of green and the style of the dress on eShakti's website, I knew it had to be mine. And as much as I love and would want more vintage dresses it is very hard to find them in the style, color, and size that I want. 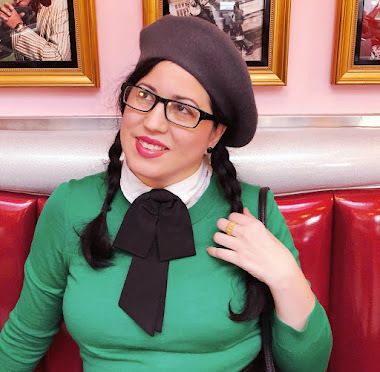 I always look for them and keep my eye out for them but I have thankfully found modern clothing that has a vintage flair. One of the things I have learned about fashion is that you should dress in a way that compliments your lifestyle. Walking around with an 80 year old dress with three children seven and under just wouldn't gel well. So, I make it work for me and add vintage where I can. This outfit is more of a modern vintagey style. I dyed my hair for the first time ever the day before and it worked out so great. I have my natural hair color back but without those pesky greys and whites. 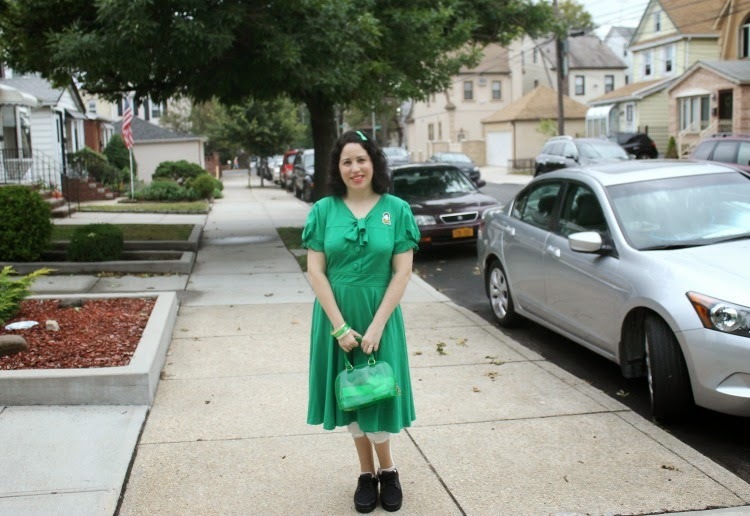 I paired my eShakti dress with a green plastic bow hair clip, a jelly handbag, and a fabulous brooch I purchased from Etsy. Mr. Darcy. I mean what is not to love! Lady in Green for the day! 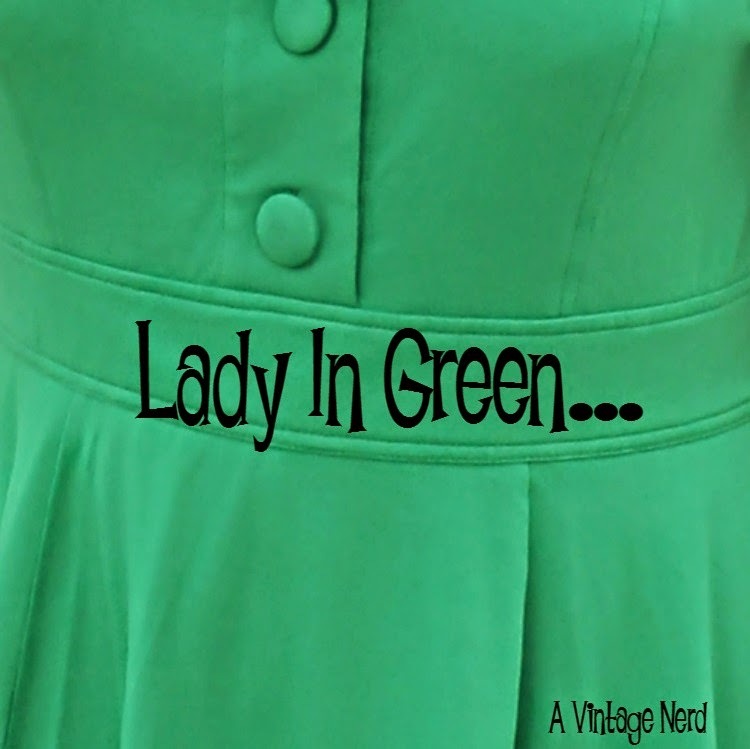 Such a lovely green dress and your hair looks just gorgeous. 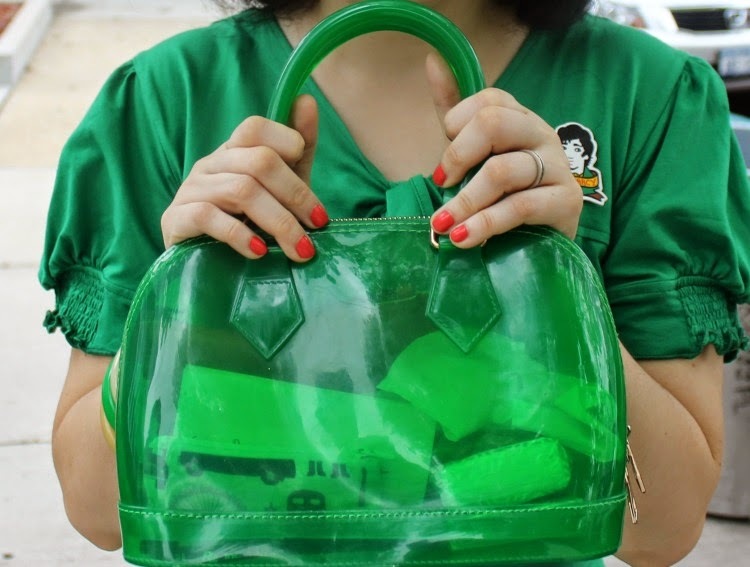 I love all those green accessories too! A very lovely outfit, green compliments you so well. Oh and to live in a place with sidewalks! You miss them when you don't have them:) I had them growing up and loved riding my bicycle, now we have to take the kids to bicycle paths or really watch them if they want to ride their bicycles near my house. Very nice ensemble. I am inspired! Your dress looks so comfortable and stylish. 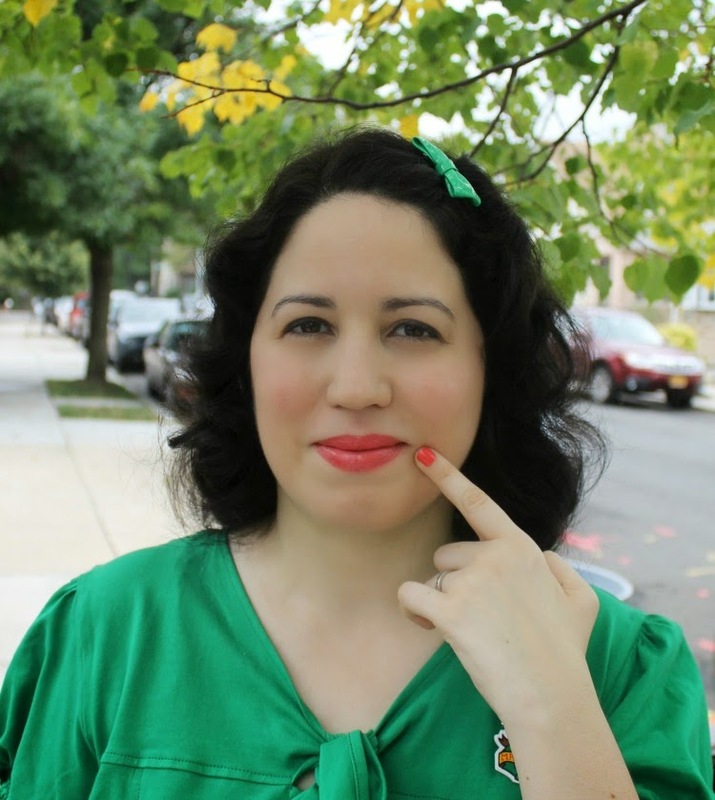 That green with your complexion and dark hair looks fabulous. I look forward to hearing more about your workshop. Green is my absolute fave of all colors, though I am drawn towards red, pink, purple, etc...shoot I just love color! 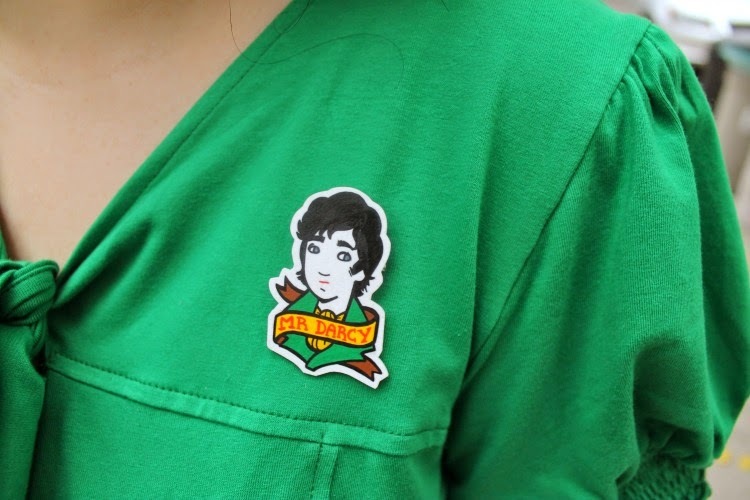 Btw- I need a Mr. Darcy pin!!!! What a great color! And that Mr. Darcy brooch!!! So cute!